If there is any irony in our political catastrophe, it is that America, the land of rugged individualism, has itself succumbed to groupthink. 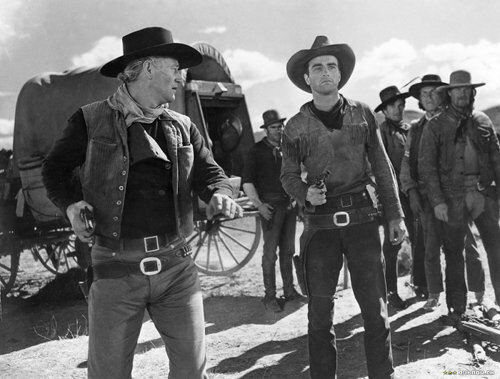 When cowboys trade in their ten-gallon hats for red baseball caps, (but still won’t let go of their six guns) you’ve got to wonder – what transformed this land of rugged pioneers into a quivering mass of petrified partisans? Individualism has been America’s calling card for centuries, once the U.S. inspired French diplomat and politician Alexis de Tocqueville to coin the term back in 1830. It was once nearly synonymous with independence; a trait borne of mortal struggle with the immense natural power of the untamed continent. Early communities could not survive without the sweat and ingenuity of the peasant folk who escaped Europe’s empires for the New World, and kept fleeing civilization to seek a sense of freedom, promise of a new life and in particular, land ownership on the frontier. So we might ask, who were these pioneers to begin with? While we may think of them as poor, uneducated country bumpkins, this simply wasn’t the case in America. In fact, complex literacy was more common in 1840 than it is today, by a long shot. These were people who felled trees, tilled fields, built homes, forged plows – and then settled down to read Melville or Dickens by the fire. Yet for all that, they weren’t individuals in the way we think of the term today. Sold on the image of the lone gunslinger riding into the sunset, we are taught to make something of ourselves, by ourselves. Spaghetti Western style. Even the histories we’re taught in school focus only on the great men and (not often enough) women who seemingly clawed their way out of the caves on their own. Rarely, if ever, do we remember that pioneers faced off against bears and braved malarial swamps not alone, but with their extended families. The same goes for the continent’s original inhabitants. Native Americans have come to symbolize freedom around the world. For example, many of those caught behind the iron curtain in the late 20th century dreamed of revolution and camped in teepees – yet this freedom had nothing to do with the obligations and responsibilities of tribal life, or the demands of indigenous religious traditions. It’s just easier to picture people enjoying the liberty of the natural world without making the sacrifices necessary for survival. Hollywood certainly let us down when it left family out of the Western myth it created. Turn to actual accounts of these ‘rugged individualists’ and you’ll find that, as in the classic Little House on the Prairie series, survival was not a matter of conquest but of cooperation, neighbors and townspeople coming together in times of trouble. Chores make for boring movies – but they played a more important role in weathering winter than any six-shooter ever did! Just as most of the 49’ers of California’s Gold Rush didn’t hit it rich, most actual Westerners weren’t involved in shootouts. For every Billy the Kid, there were thousands of communities that spent their time not chasing down bandits, but clawing enough money from their trades to set up one-room schoolhouses for children that also doubled as church on Sundays. The fact that these efforts rarely hit the silver screen tells us something about our artists. To be fair to Hollywood, there may be something more profound to this problem. After all, Americans were already mythologizing the West in the 1830’s, when outlandish tales of Davy Crockett’s adventures were sold in almanacs up and down the country. As the actual senator battled with debt and scandal, enthusiastic readers devoured tall tales of his coonskin-capped bravery, much as their descendants watched John Wayne, who ironically was one of the few actors available for those roles having failed the physical for real active military duty during the war. It’s no wonder the sane among them lit for the Appalachians. More to the point, it seems entirely possible that the quest of the mythical mountain man or cowboy escaping the madness of a tyrannical mother, that is, European civilization, has particular resonance with Americans, who are the products of that effort. Still, the question remains: what of the frontier families, what of the mothers and daughters? The problem may be more than historical. Even in its infancy, the 21st century has taught us just how bad we are at understanding complex systems, like the environment, the economy, and the behavior of groups of people. Our linear experience of time and language can only handle so many simultaneous interactions before we settle for an ideal image or stereotype. This is how mythology is born. Our innate mental thrift drives us to find the shortest storyline between two points. Yet in an ecosystem encompassing constantly changing individuals and endlessly fluctuating conditions, there is no shortest line. Human narratives can’t completely comprehend the world they seek to describe – but they’re the only tool we, as individuals, have. So, we invent stories, stories that speak to the times, places, and prejudices of their makers. Classical individualists recognized these limitations, without the aid of our modern theoretical apparatus. Their vision of individualism wasn’t about isolated people living alone in the wilderness – it’s almost impossible to imagine anyone doing this successfully for very long. After all, we can't all be Leonardo DiCaprio in The Revenant, single handedly fighting off bears and trekking through the snow to find redemption. Instead, it’s about creating and then relying on local systems of families and communities – with all the responsibilities and obligations that both bring – to solve problems and provide meaningful lives for their members. Why was this insight lost to time? And why don’t we think of this as individualism? Just as chores don’t make for exciting movies, self-reliant societies don’t make for needy consumers, as at least not at first. There is a dark side to the cynical logic underlying the story of the Wild West we’ve all been fed: if you divorce people from their communities, you’ve got them in the palm of your hands. Once the industrial revolution profoundly transformed society, the Progressive Era that followed took up the problems we were left with. And just as the language and aesthetics of technology has overtaken us today, during the Progressive Era, scientific language and ideologies were very much in vogue. This idea, that applied sciences alone would bring revolutionary change to the world was the equivalent of the naive idea that social media innocently connects the world today. Additionally, it’s no coincidence that such seemingly disparate trends as electricity, evolution, and eugenics were being debated during the Progressive Era in the same way we now debate surveillance, privacy, and reality itself. They are dangerous and fascinating ideas looming over society like a the powerful yet dark clouds they are. Rational principles were at war with tradition, and reformers (now engineers) envisioned a new world where reason might deliver heaven on earth, or at least in VR. Think now of the most irrational, emotional, and traditional aspects of life. They are precisely those of family, community, and religion, the historical foundation of community life. Each of these social institutions represents challenges to a strictly scientific or data based system of manipulation. Strong families, communities, and churches provided localized employment, sustenance, and purpose to individuals on the frontier. The twisted logic of mass centralization simply suggested that these archaic bodies be dissolved. Industrialists seemed to pursue this dissolution with, shall we say, religious fervor. Across fields like education and immigration, corporate foundations and their government partners were promoting a new vision of life, one centered not on community, but on the new scientifically defined individual, isolated, as it were, in a social psychology experiment. Leaning hard on the concept of “the pursuit of happiness,” our modern idea of individualism treats desires as absolute and life as a matter of fulfilling as many of them as possible. Purpose is the result of individual effort (preferably in the workplace), and meaning, a creation of the isolated mind. Even right and wrong are subjective; they say the only things in life that are true are death and taxes, but we'd also argue that just about the only measure of value left to us is profit and loss, or voter totals. In this topsy-turvy world, popularity is just a better indicator of virtue than anything else. This may account for the fact that social media addiction is rampant as people grow lonelier than ever. Here, too, we see the same dynamic at play – people stripped of their ties to family, history, and place, sinking into an abstract wasteland controlled by someone else. Experts and innovators are doing their best to make millions of Lone Rangers out of what’s left of the nation’s communities. Today, we sit on the ruins of this Scientific Individualism. As even our attention is commodified, the most powerful companies in the world trigger emotional responses through symbols and psychological games. Buffeted by billboards and assaulted by advertisements, we try to make sense of a world that is at once enticing and repulsive. Most importantly, we do it alone, in our cars, in rush hour traffic, with the latest Billboard hits on full blast to drown out our anxiety. Like good individuals. On his tour of America two hundred years ago, de Tocqueville observed that “Aristocracy links everybody, from peasant to king, in one long chain. Democracy breaks the chain and frees each link.” But Individualism meant that people were free from the king, not from their neighbors.